When I was pregnant with Georgia, I really didn’t have too many cravings. I was hungry for fats, salts & fruits, but other than that, it was pretty easy. There was no midnight runs to the store for banana ice-cream or anything fantastic like that. But on Sunday, I came home from church with my mouth watering for pea salad. I couldn’t get it out of my mind. It’s all I could think about. Pea salad. Pea salad. Pea salad. My best friend Carlee’s Mom used to make the most wonderful pea salad. I still remember sitting down with bowl after bowl of it in the summer time. Man, those were the good old days when someone else used to cook for me. Sigh. I’ve never made pea salad in my married life until this weekend – mainly, because Stuart doesn’t like peas. And I wanted to eat them. This salad is fantastic – coming together in under ten minutes. And it’s so heavenly and delicious. Especially if you like peas. Do you like peas? I do. I think they’re wonderful. Combine all the ingredients in a bowl. Toss. Salt & pepper to taste. The end. You’re a rockstar. I ate a generous portion (or two…) with some grilled chicken thighs and German potato salad. It was a Sunday feast at it’s best – complete with sunshine & warm weather! Here’s the funny thing about pregnancy cravings though – as soon as they’re filled, the food makes me want to gag. For example, last week, I was really craving egg rolls. So I made some, which tasted delicious. Soon after though, the thought of an eggroll sent nausea chills up my spine. And now the thought is almost more than I can handle. So for a few months, I am pretty much on the “Post-Flu” diet, as I lovingly refer to it. This includes (but is not limited to): buttered rice, scrambled eggs, canned peaches, oatmeal, toast, and bananas with peanut butter. Yum! Take this salad to your next BBQ or get together. It’ll be fantastic. I promise. « Fine! I’ll tell you already! We didn’t get many peas from the garden this year, we’re going to try a different variety I think next time. But this sounds good and I probably have enough to do this recipe. 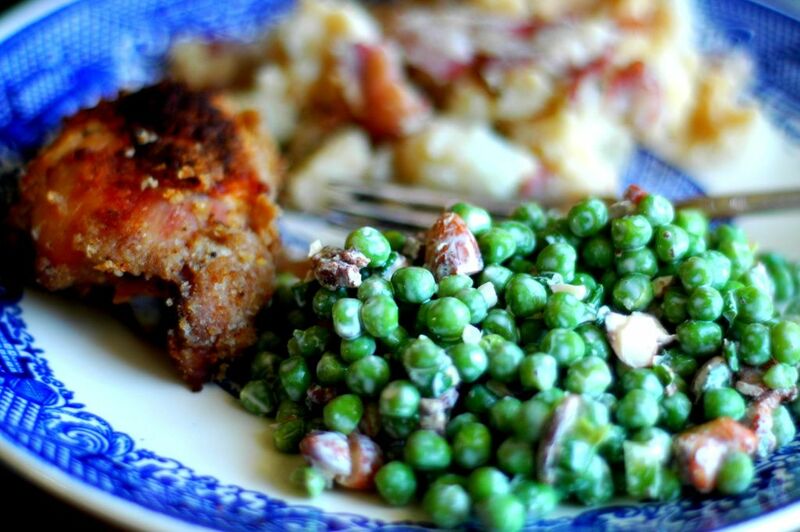 I’ll have to try this recipe..I love pea salad! Isn’t it crazy how two people can make something using the exact recipe and it turns out tasting different? I love to cook and eat what I cook but I always love someone else cookin’! Wow! That sounds amazing. I am not a fan of sour cream, but everything else sounds amazing. I will have to make a version of this!! I have been thinking of making a Good pea salad, and this looks wonderful. Your pictures, presentations and directions are Excellent! I Will be visiting your site again….Thanks! I am going to make this using homemade mayo! 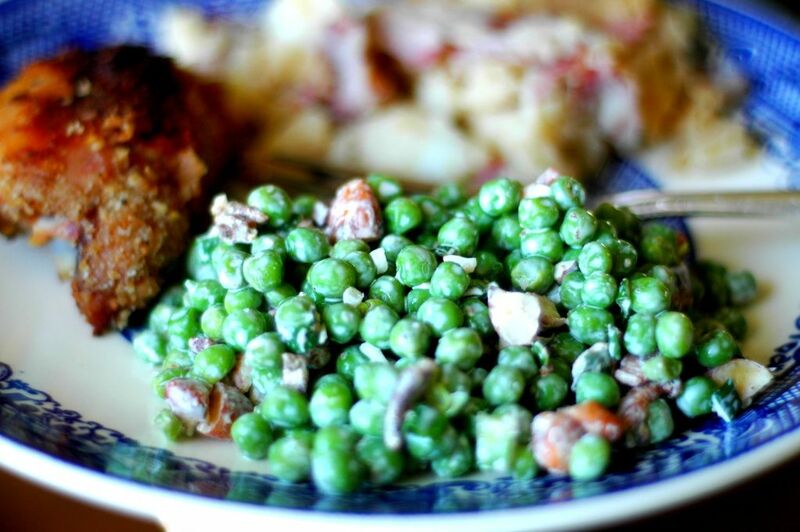 Love peas…and all your recipes too!